This entry is part 2 of 2 in the series Building a Better SharePoint Calendar. I built this solution using a SharePoint calendar list called “Calendar,” but it could be named anything; you’d just need to update the listName option in the SPServices function (I’ll get to that later). This is the easiest part of the whole process. Create an empty <div> with an ID to load the calendar inside using a content editor web part (CEWP). // Assign buttons to the header of the calendar. See FullCalendar documentation for details. firstHour: "5", // Set the first visible hour in agenda views to 5 a.m.
// Add events to the calendar. This is where the "magic" happens! // Create an array to hold the events. At this point you should have a blank calendar on the page with no events. You can read through the Fullcalendar documentation for more details on the available options (the documentation is actually quite good), but for use in SharePoint the one option you want to make sure you include is weekMode. 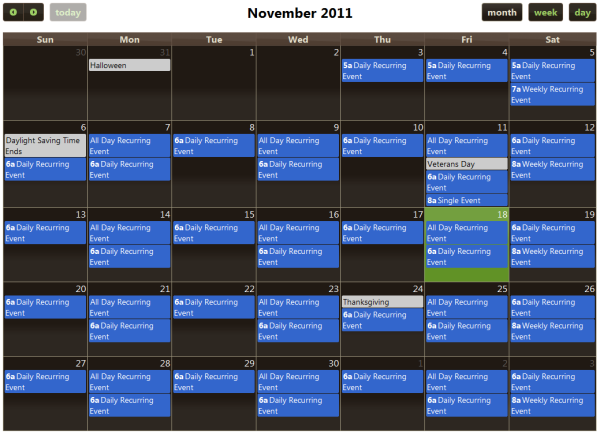 By default, Fullcalendar displays six weeks in the month view to account for those 30 and 31 day months that start at the end of the week (check out October 2011 for an example). When you retrieve a month’s worth of events from SharePoint, the web service is smart enough to include events in the previous and next month that would be visible in the current month view, but it only retrieves them for the weeks that are needed (usually five weeks-worth of events). Therefore we’d have a sixth week on the calendar that wouldn’t be fully-populated with events. By setting weekMode to “liquid” or “variable” that sixth week won’t be rendered on the calendar unless it’s needed for a month that spans six weeks. Next you need to give the calendar events to display. We’ll use SPServices to retrieve our calendar events based on the current calendar view. This is where Jim Bob’s solution really came through. By passing the appropriate CAMLQuery, CAMLViewFields, and CAMLOptions to the web service, it returns recurring events as separate, individual events. We’ll need to include a start date from which to retrieve our events for the <CalendarDate /> value and a date range for the <DateRangesOverlap /> value (either “<Week />” or “<Month />” in this case). The <CalendarDate /> value is used in the CAMLQuery and the CAMLOptions options, and the <DateRangesOverlap /> value is used in the CAMLQuery option. // Set the date from which to pull events based on the first visible day in the current calendar view. For a month view, this will usually be several days into the previous month. We can use FullCalendar's built-in getView method along with the formatDate utility function to create a date string in the format that SharePoint requires. It must be in the format YYYY-MM-DDTHH:MM:SSZ. Due to time zone differences, we will omit everything after the day. // Get the current view of the calendar (agendaWeek, agendaDay, month, etc.). Then set the camlView to the appropriate value to pass to the web service. This way we will only retrieve events needed by the current view (e.g. the agendaWeek view will only retrieve events during the current week rather than getting all events for the current month). // Set the camlFields, camlQuery, and camlOptions to the appropriate values to pass to the web service. You can add additional <ViewFields /> or adjust the CAML query if you have some custom columns that you want to filter by or display data from. The values below are the pretty much the minimum you'll want to start from to get it working. // Make the web service call to retrieve events. listName: "Calendar", // Change this to the GUID or display name of your calendar. If the calendar is on a different site, you can use the display name with the webURL option (see SPServices.CodePlex.com for more information). // Get the start and end date/time of the event. FullCalendar will parse date strings in local time automagically, and we don't need to do any local time conversions for all day events, so we can use the UTC date strings from SharePoint without converting them to local time. // Get the start and end date/time of the event. FullCalendar will parse date strings in local time automagically, so we need to convert the UTC date strings from SharePoint into local time. The formatDateToLocal() function above will take care of this. See comments in that function for more information. // Format UTC dates as local date/time strings. var month = "" + ( dateUTC.getMonth() + 1 ); // Add 1 to month because months are zero-indexed. Now that thisADE, thisStart, and thisEnd are set, the function just needs to get the event title, ID, and description (actually, you don’t need the description, but I’m retrieving it anyway because I will probably use it for a tooltip or something similar when hovering over the event in a future enhancement). The ID changes format based on the type of event. If it’s a single, non-recurring event, it will just include the list item ID. If it’s a recurring event, the ID will include the list item ID, the number “0,” and the date/time of the recurrence in UTC format. These three items will be separated by “;#” in SharePoint 2007 and by “.” in SharePoint 2010. You can use some string manipulation to parse out that information depending on the type of event and format it so it’s usable as the ID query string parameter when generating the URL to view the event details. This code should immediately follow the if...else block that sets the thisStart and thisEnd variables. // Get the list item ID and recurrence date if present. This will be used to generate the ID query string parameter to link to the event (or the specific instance of a recurring event). The ID query string parameter must be in the format "ID.0.yyyy-MM-ddTHH:mm:ssZ" for recurring events (where "ID" is the list item ID for the event). Event ID's are returned as just a number (for non-recurring events) or several numbers separated by ";#" in 2007 or "." in 2010 to indicate individual instances of recurring events. By splitting and joining the ID this way, thisID will be set to a valid query string parameter whether an event is recurring or not for both versions of SharePoint. // FullCalendar documentation specifies that recurring events should all have the same id value when building the events array (the id is optional, but I'm including it for completeness). We can get the list item ID (which is the same for all instances of recurring events) without the recurrence information by simply splitting thisID. // Get the event title. This is displayed on the calendar along with the start time of the event. // Get the event description. I don't use it in this example, but you could use it for something, perhaps as a tooltip when hovering over the event. Next, you need to push all of this information into the events array along with the URL to view the event. I’m also including a Source parameter that brings the user back to the current page, but you could omit that if the default view for the calendar is set to the page that Fullcalendar is being used on. Place this code after the previous code block. // Add the event information to the events array so FullCalendar can display it. // Adjust this URL to link to the display form for your calendar events. You can include a Source parameter to allow users to easily return to the FullCalendar page. Here is the <script> block in its entirety. I still have some limitations to overcome, which I’ll focus on in a future post in this series. Unfortunately I don’t have a working demo on a public website, but I’ll try to update this post if/when I do. As always, questions, suggestions, and critiques are welcome in the comments! Using the code above, I can’t seem to get any events to load that do not overlap the initial view (Month, in my case). I’ve tried this with lazyFetching on and off with no change in the behaviour. Do I need to bind a callback to the back, forward and view change buttons to reload events? You do know that .find( ‘[nodeName=”z:row”]’ ) is no longer supported in jQuery 1.7 right? Yes, that’s true! I always make it a point to specify which version of any scripts I am using in articles like these (in this case I specified using jQuery 1.6.4 and SPServices 0.6.2) because things sometimes break in newer versions. I hadn’t been using 1.7 at the time, but anyone who does use it (and SPServices 0.7) will want to make the change you mentioned. Are you interested in doing some subcontracting? We have some very cool opportunities that I think you would be a great fit. The demo site ( http://SPDWiki.com/SiteAssets/FullCalendar-demo.html) gives me a 404 error. Has anyone else created a demo? Has any additional work been done on this topic? I’m trying to connect from an intranet website to a SharePoint server on another server in the intranet, specifically to grab the calendar. Sorry, the demo has been down for a while and I don’t have access to a public-facing SharePoint site to create another demo. If you don’t have to worry about recurring events, you might try the previous article in this series, which uses a Data View Web Part to generate the JSON for FullCalendar (you could use an aggregate data source to load events from multiple locations). When a user is browsing the calendar and change months, Is it possible to navigate back to the “month” where the user was when clicked on the “item title” insetad of defaulting back to the current month? It is possible, but it would require adding the current month you are viewing (or week, or day) in the Source parameter of the URL query string for the item title’s link, and then hooking into FullCalendar to make it display that month (or week, or day) if the query string has that present. This is an enhancement I’ve been wanting to work on for a long time, but it hasn’t been a priority for any of my recent projects so I haven’t taken the time to work it out. If you do, please stop back here and share! I am having some pretty extreme trouble getting this to work in SPS 2003. Will you send me an email so I can ask some more detailed questions? Great job on this post. I am looking for a solution that will display 2 months at a time, current and next month. Do you know how to achieve this? Hi Larry, I’m not sure how to do that using FullCalendar off the top of my head. You could probably have two instances of FullCalendar on the page and do some kind of month + 1 calculation for the second calendar. Josh – This is absolutely fantastic!! I’m using it in a new deployment of SP 2013 in a few places. A couple questions I have however are: 1) how can I reduce the min-height being placed on the day cells in the main month view of the calendar?, and 2) how can I remove the time from the event items? 1. Try changing the height option when initializing FullCalendar which changes the total height of the calendar (see http://arshaw.com/fullcalendar/docs/display/height/). // Add the category as a class name for the event, but replace any spaces with a dash (and make sure you don't use any other illegal characters for a class name when creating categories). but it doesn’t seem to be working. I’m thinking I’ve probably just got some small error in the syntax somewhere. Can you spot anything wrong with it? Thanks for the excellent blog. I followed your blog and everything working as expected, expect duplicate entries. Whenever, navigate to next month, I see duplicate entries. Any idea what I am missing? Any links/hints would be a great help.